Well, whatcha know – it’s my last full day in Iceland! Dorianne left in the early morning hours before I awoke so, officially, the great travel partner experiment is over. I think overall it was alright although by the end I’m pretty sure we were getting on each others’ nerves. We slowly drifted apart going our separate ways once we were checked in at our destinations. But at the end of the day I’m thankful Dorianne invited me on her trip. After all, if it weren’t for her, I would have never planned a trip like this on my own. And she did all the driving which must have really sucked as some of the days were long. Plus she had to endure my cold for the first few days which of course she inevitably caught herself. So, thanks Dorianne. Thanks for everything but most importantly thanks for not leaving me on the side of the road somewhere even though I’m sure you wanted to several times. Anyway, I woke up late this morning around 10am and the plan was to visit the Árbær Open Air Museum. The museum is actually a little outdoor village showing how life was historically in Iceland. In December they were offering a unique tour everyday at 1pm about their Christmas preparations and celebrations including the Yule Lads (traditional Icelandic Santa Clauses). The museum is actually in the suburbs so the only way to get there is by the local transit. 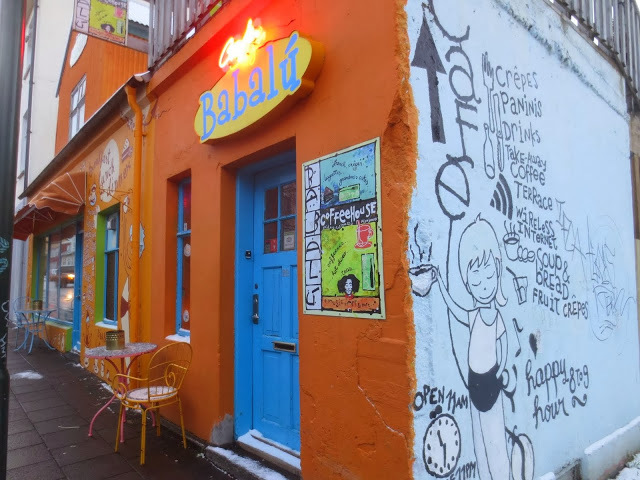 On my way to the bus station I stopped for breakfast at the highly rated funky little cafe called Cafe Babalú. I had a nice savory ham and cheese crepe with bechamel sauce and a Swiss Mocha. It was nearing noon by the time I was done my meal so I continued to the bus station. 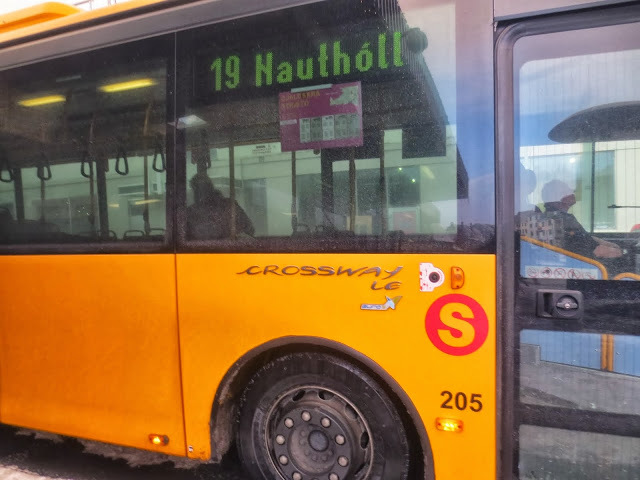 After asking at the front desk and then again at the bus station I boarded bus #19 for what should have been a half hour ride. The bus left at noon so I had plenty of time to get to the museum. I showed the bus driver the name of my destination written down on a piece of water because, well, there was no way I could pronounce it. He said no problem and that he would let me know when we got there. As we left the main city the winter wonderland outside picked up as you could see snow blowing in the gusty wind. My desire to walk around an outdoor museum was slowly fading – Yule Lads or not. A little while into the trip the bus driver picked up his wife and their baby. I think it was at this point that he forgot all about me as he was now preoccupied with them. The minutes passed and before I knew it, it was 1pm and I started to recognize some of the buildings I had seen on the drive out of the city. Yup, we were heading round trip back to the bus station. I got off the bus and just kind of laughed. I just took an hour bus ride through the snow covered streets of the suburbs. No big deal. Like I said, my desire to wander around outside had pretty much faded. I decided to visit a nearby church instead. 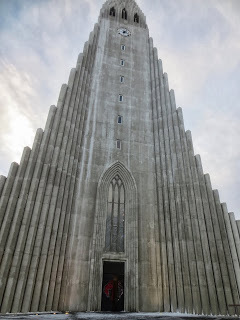 Hallgrímskirkja sits on the edge of downtown Reykjavik and overlooks the city. 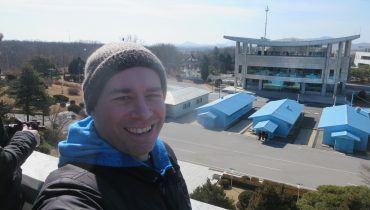 I went inside and bought a ticket to go up the elevator to the bell tower. Once at the top I quickly realized that visiting the church on a windy wintery day was probably not the best idea as it was damn cold up there. I quickly looked over the city from the different vantage points, took some photos and videos, and was on my way back down to the nice warm confines of the main church. I soon went outside braving the swirling wind to do a little more shopping. 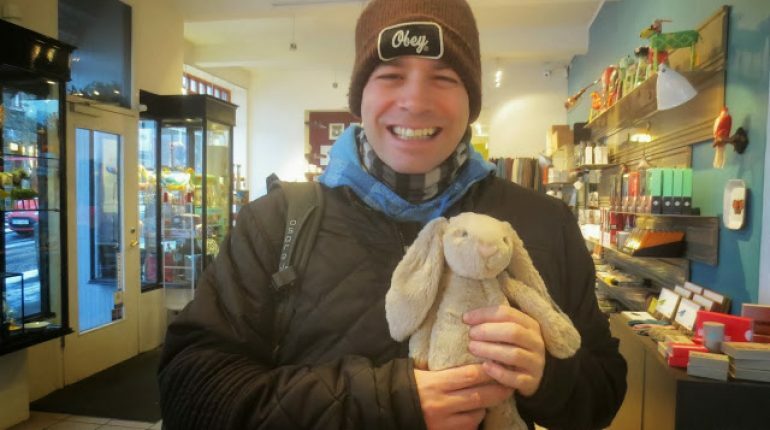 A few days ago I saw a cute little stuffed bunny display at a store right across from my hostel so today I went inside I picked one up. I also bought some jewelry and a copy of the Icelandic CD we spent countless hours listening to in the car. 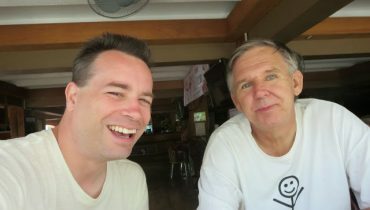 In the afternoon I just relaxed in the common room at the hostel before heading out to dinner just after 5pm. I stopped by a restaurant I had passed earlier in the afternoon. Their menu board offered a 3 course meal so I went inside. It was empty and I had to ding a little bell at the host stand to let them know I was there. This is not a good beginning for my last dinner in Iceland. When I was finally sat I didn’t see my server again for five minutes. Well this is not how I want my last dinner in Iceland to be. I picked my stuff up and walked out the door. 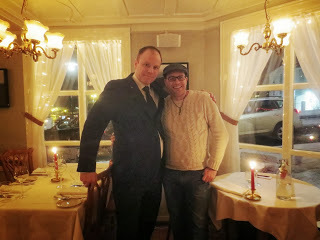 I knew where I was headed – back to Lækjarbrekka where I had that wonderful dinner last night. I was greeted by Hreinn‘s smiling face and I knew immediately I had made the right decision. He sat me at the best table right by the window and I ordered the 5 course Christmas tasting menu they were offering. While I was waiting for my meal to begin Hreinn was telling me about his cocktailing prowess as he had won an award last year as the top cocktailer in all of Iceland. He then had an opportunity to compete at the world championships in Beijing, China where he placed third in his category. So, of course, how could I say no when he offered to make a cocktail for me while I waited for my meal. He whipped up a nice fruity martini made from Bacardi rum, peach schnapps, raspberry sourpuss, cranberry juice and flower water. Oh my God it was so good. So smooth and it drank just like juice – just the kind of drink I like even if they are a little dangerous because of just how easy they go down. 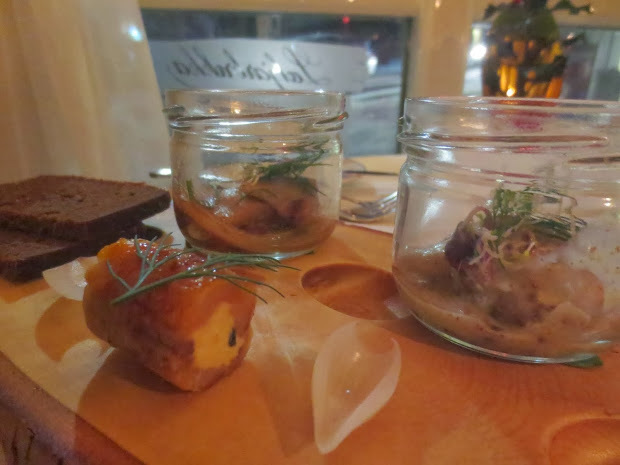 My first course was a selection of herring done three ways: herring with tomato and date, smoked herring with pickled pearl onion and sour cream, and honey and grain mustard herring. 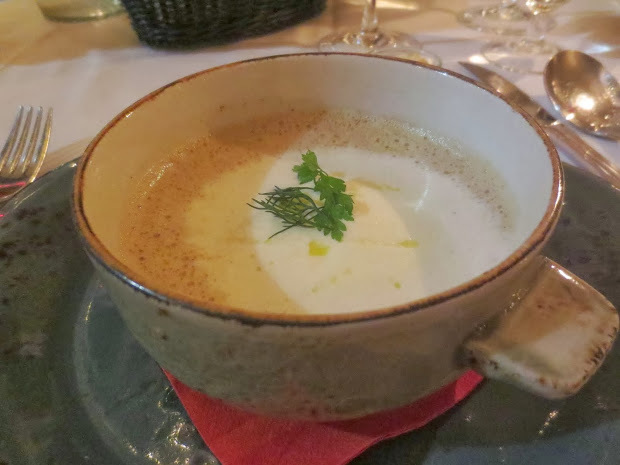 Soon after my second course arrived – a nice light, frothy wild mushroom soup topped with a truffle cream. It simply melt in my mouth and you can pretty much put truffle on anything and it will taste amazing. 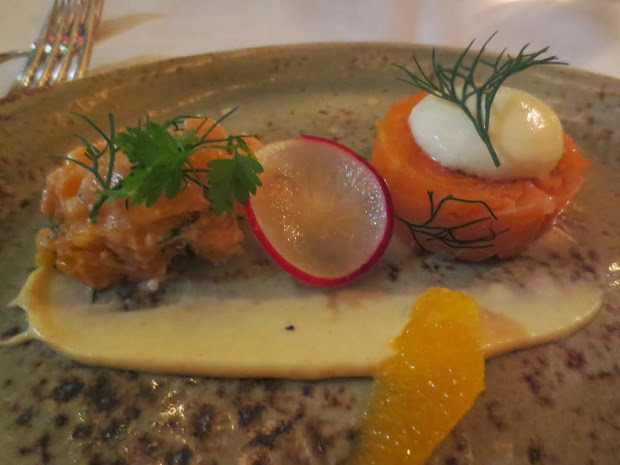 My final appetizer was Arctic Char ballontine which was a tartar with cauliflower foam and dill. For the main course I was served duck done two ways: a breast and confit. It was complimented with a maple syrup and cinnamon potato, marinated apricots, a grand marnier sauce and ginger bread. Unlike the other night I had room for dessert. I also asked Hreinn to whip up a nice dessert cocktail to compliment it. 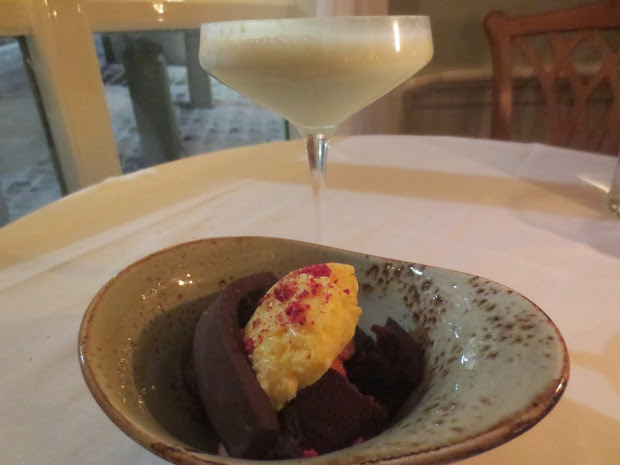 He came through once again with flying colors as he served me the perfect cocktail – a light, frothy mix of white cacao, grand marnier and white creme de menthe. It went perfectly with my dessert: a chocolate brownie with cappuccino ice cream and vanilla glazed strawberries. 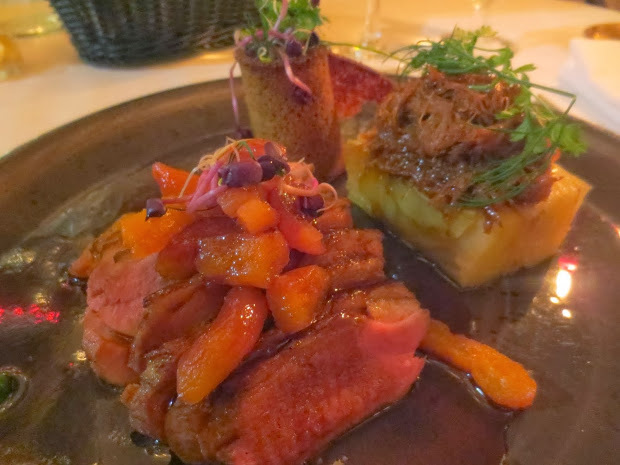 Simply put – a perfect last dinner here in Iceland. Yes, at 13,300 kronas (about $125) it was a little on the steep side but it’s funny how money doesn’t matter as much when you’re travelling. Take that as either a good or bad thing. As I sat at the table between courses I just kind of looked out at the snow covered streets thinking I could seriously do this for the rest of my life. Now I just need to figure out a way to do it!